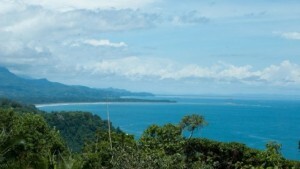 Located just above Playa Dominical and the beautiful Playa Dominical Point, is this very special opportunity to purchase one of the finest ocean view land parcels left in the area. The property consists of 13 acres with jaw dropping front row ocean views down the coast! Gaze as far as the eye can see down the coast where you can see the entire Osa Peninsula and the popular dive destination of Cano Island. You can also watch the tide ebb and flow over the world famous Whale’s Tail at Marino Ballena National Park. The primary building site is flat and can accommodate an incredible luxury estate with room to spare for landscaped gardens and a resort style pool area. The additional acreage surrounding the property will ensure that your views will never be obstructed. Below the primary building site is another flat building area that would be the perfect location for a guest home and caretaker’s quarters that would be surrounded by lush tropical rainforest. Come up with your own designs or simply contact us and we will provide you an extensive referral list of experienced builders and architects in the area. Properties like this one are becoming increasingly hard to come by. This in fact is the last remaining front row land parcel of this size anywhere around! This land parcel has everything someone could possibly ask for when seeking land in the area. It is located exactly 700 yards from the surf, has easy access to the main coastal highway, it is a short drive to either Dominical or Uvita, plus there is a beautiful hotel / restaurant right across the street. This is an all around beautiful property and it will not last long.